Hawksbill turtles - Large populations remain only in Sabah & Malacca. Both populations appear to be stabilising. However it should be noted that historical nesting data in Malacca extended to 1990, which is quite recent and too short term to surmise on population trend. Malaysia is fortunate to host four species of marine turtles: Leatherback, Green, Hawksbill, and Olive ridley turtles. These gentle reptiles of the sea swim great distances and come on land only to nest. They are known for their longevity among local cultures. Sadly, the number of marine turtles in most places has plummeted and some populations are on the brink of extinction. Female turtles lay hundreds of eggs each nesting season. But relatively few young survive into their first year. Crabs, monitor lizards and birds eat the eggs or prey on hatchlings as they make their way out to sea. In the shallows, many more hatchlings are taken by fish. When humans harvest turtle eggs, disturb or degrade nesting beaches, the young turtles’ chances for survival slide further. They are threatened by the loss of nesting and feeding habitats, excessive egg-collection, fishery-related mortality (for example, accidental mortality in the nets and long-lines of fishing fleets), pollution, and coastal development. Turtles that survive take decades to reach maturity and start breeding. But escalating mortality means fewer turtles are living long enough to reproduce. Effective conservation means protecting turtles at all stages of their life cycle. 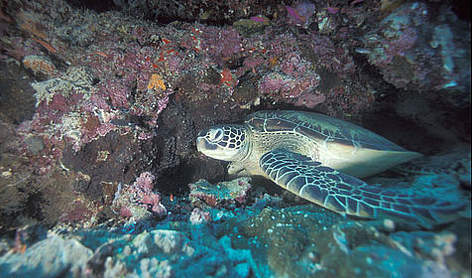 Hawksbill turtle in its habitat, surrounded by corals. Due to man’s taste for beautiful jewellery and ornaments, the hawksbill turtles are now critically endangered. Their thin, flexible and highly coloured shell with elaborate patterns is the sole source of commercial ‘tortoise shell’. Locals know them as Penyu Karah or Penyu Sisik but hawksbills are so named because of their narrow pointed beak reminiscent of a bird of prey. The largest population of hawksbills is found in the Turtle Islands of Sabah, Malaysian Borneo with an average of 500-600 nests each season. Malacca’s sandy coastline has the second largest population of hawksbills with 200-300 nests per season while Johor and Terengganu have lower numbers. The endangered olive ridley or Penyu Lipas is the smallest of all marine turtles. These migratory turtles often travel thousands of kilometres between feeding and nesting sites. Very little is known about these turtles in Malaysia. The endangered Green turtle, or Penyu Agar to the locals, is actually black-brown or greenish yellow but is so called because of the greenish colour of their cartilage and fat deposits. The most abundant species in Malaysia, it nests in great numbers on the sandy beaches and islands of Sabah, Sarawak, Terengganu, Pahang, Johor and Perak. Largest of all marine turtles, leatherbacks are also one of the largest living reptiles. They are easily distinguished by their leathery carapace (shell), unlike other turtles which are hard-shelled, and by their long front flippers. Seven ridges run down the length of their white spotted carapace. Leatherbacks are one of the most migratory of all marine turtles. The biggest ever recorded leatherback turtle was a male that reached 256 cm long and weighed 916 kg! They can also dive much deeper than any other marine turtle. The deepest dive ever recorded for a reptile was by a leatherback to a depth of 1,230 metres. The critically endangered leatherback turtle or Penyu Belimbing to locals, is now facing extinction in Malaysia. Rantau Abang, Terengganu used to be the nesting home of one of the seven largest leatherback populations in the world but its population has declined by more than 99% since the 1960s.